Bologna‘s area has been developed since the 9th century BC, so the city is studded with monuments dating from various centuries. The Two Towers, Garisenda and Asinelli, which derive their names from the families who wanted to show their power by making them built, date back around 1110. The latter is 97.2 meters high, and it is the only one that can be visited, since the other one is closed to the public. The stunning view that can be enjoyed from the top of the Asinelli Tower it is worth doing. 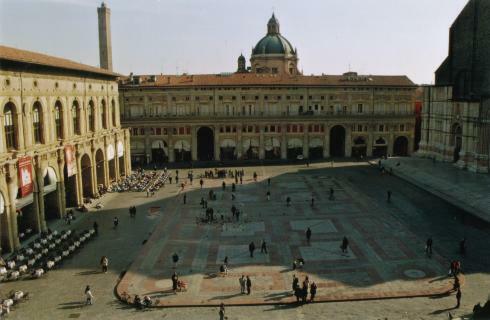 Not far from the Two Towers, there can be found the San Petronio’s Basilica, whose first stone was laid in 1390, but its facade is still unfinished. Santo Stefano’s Basilica, also known as Seven Churches, with its place, is Bologna’s second attractive site. If you still have some time left, you can go to the Sanctuary of the Madonna di San Luca (in English St. Luke’s Sanctuary), which is 3.5 kilometers away from the city. It can be easily reached by foot through a roofed arcade. It is located 300 meters above the plain, and this makes possible to see an outstanding skyline of the city. One suggestion: mind the mosquitoes!